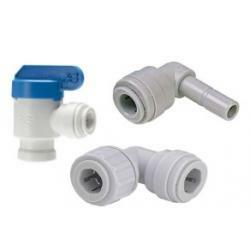 We provide a range of top quality John Guest (JG Speedfit Plumbing Connections) , Mur-lock push fittings and push fit connectors. These are available in a range of sizes to suit your requirements and are designed for the easy connection of water filtration systems, vending machines, water coolers, coffee makers, fridges and more. 1/4" Push Fit to 1/2" Male Straight Connector ..
DM Fit 1/4" Push Fit to 1/4" Male Straight Connector dual pack.Made for easy connection. ..
1/4” Pushfit x 1/4” Pushfit Elbow The 1/4” Pushfit x 1/4” Pushfit Elbow is designed to connect tw..
15mm Push Fitting to 1/2" BSP Male Thread 15mm tube x 1/2" Male Connector (BSPP) used f..
15 mm x 15 mm X 1/4" Slip Tee Valve This product enables you to connect a 1/4" tube to a 15 mm co..
15 mm x 15 mm X 3/8" Slip Tee Valve The Slip Tee valve enables you to connect a 3/8" tube to a 15..
3/8" Stem to 3/4" Male Thread This fitting is ideal for easy connection to a washing ma..
DMFit 1/4" Push Fit to 5/16" Stem Adaptor The ARD0405 enables you to connect a 1/4 Inch Push Fit ..
DMfit AFAB0606C Female BSP Connector - 3/8" Push-in x 3/8 BSP(P) conic inside Acetal copolymer co..
DMFit 3/8" Pushfit x 1/2" BSP Male Straight Adapter For use with spot face ports. Features:&nb..
DMfit Plug-In Stem Elbow - 1/4 Tube x 1/4 Stem Acetal copolymer construction O-rings are NBR (Bu..
John Guest PIO61208S Stem Reducer 3/8" x 1/4" John Guest Quick Connect Fittings Model N..
John Guest 1/4" to 1/4" Push Fit Shut Off Valve PPSV040808W Model number: PPSV040808W ..
John Guest 15mm x 3/8" Straight Connector The John Guest 15mm x 3/8" Straight Connector..
John Guest 3/8" to 3/8" Push Fit Shut Off Valve PPSV040808W Model number: PPSV040808W ..